Human sacrifice has been an important religious activity throughout history. Sometimes it is done as an offering to a deity or to appease an angry god. In the Christian Bible, God tells Abraham he must sacrifice his son, Isaac. Abraham agrees to this without arguing, although an angel stops him at the last moment and a ram is sacrificed instead. According to Classical sources, Phoenicians and Carthaginians sacrificed infants to their gods, while Julius Caesar reported that the ancient Druids were particularly keen on human sacrifice. The image of the humans being burnt to death in a giant wicker man is an enduring one in popular culture. Today, Satanists are often associated with human sacrifice, even if that image has more to do with horror movies than reality. The problem is, human sacrifice just isn't that easy to do - or to get away with doing without getting caught. 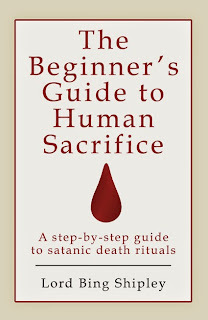 If it is something you are interested in, however, The Beginner's Guide to Human Sacrifice by Lord Bing Shipley offers a step-by-step guide to satanic death rituals that even the most squeamish could find entertaining. The trick is to start small. A jelly baby is perfect to practise on. You can decapitate them, disembowel them, defenestrate them, burn them in little wicker men or even eat them - the choice is yours. This obviously needs to be done with suitable ritual and wording, but you can use your imagination on that account. You could set out an altar - although the desk at work during a coffee break is just as good. You also need to make sure the date on which you conduct the human sacrifice is most auspicious. Lord Bing Shipley recommends the morning of April 1 as being ideal.